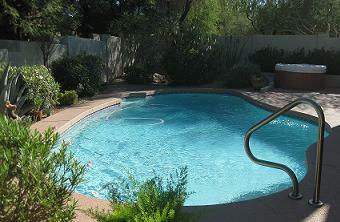 Pool maintenance is something that may be hard for busy families to keep up with here in the Phoenix area. Depending on the type of pool you have, maintaining it can take some time, especially if the pool is large or deep. Maybe you haven’t even purchased a pool, because you know that you don’t have the time or the energy to keep up with any swimming pool maintenance. We are ready and willing to help you keep your pool in good shape so you’re ready to entertain or go swimming at any time. The pH levels of the pool need to be maintained, and this is done through the use of muriatic acid. A safe level for pH is around 7.5. Total dissolved solids need to be checked every six months, and the calcium hardness of your pool should be checked once a month. Algaecides and shock treatments can be applied to the pool on an as-needed basis to keep the pool healthy and safe. Brushing the walls of your pool on occasion can also be a good way to keep any algae from growing on the tiles. 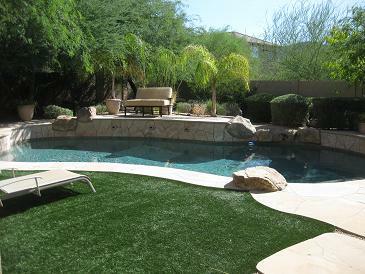 Dan's Pool Catering, the swimming pool maintenance company in Phoenix AZ. Keeping an eye on chemicals when it comes to pool maintenance is important for not only the safety of the people in your pool, but unbalanced levels can also damage pool equipment and even the pool’s structure over time. We know how to apply different treatments and chemicals to keep the chemistry of your pool balanced, whether you are in Glendale, Scottsdale, Mesa or any other nearby city. While there are many different chemicals and treatments that can be used during swimming pool maintenance, the chemistry of your pool isn’t the only thing to worry about when trying to keep your pool clean. Maintaining your pool properly also involves removing all the day-to-day debris that collects on the bottom or surface of your pool and in the filter. A skimmer can help you clean the surface of your pool, but it can’t do the job for any sand or dirt that has collected on the bottom of the pool. Your pool needs to be vacuumed from time to time to make sure this sand and dirt are eliminated. There are also different baskets in different kinds of pools that collect debris. We can clean these out as well. Our pool services are done with our customers in mind. We want to make sure you are satisfied and have the most sparkling and clean water in your pool. While performing pool maintenance, we can also check to make sure your pool doesn’t need any routine repairs. The chemistry and cleanliness of your pool are the most important factors in pool maintenance. Whether you’re hosting a pool party soon, have just purchased a new swimming pool, or reopened your pool after closing it for a season, we can help you keep your pool in good shape. Pool maintenance is second nature to a company like ours, because we have been doing it for years all around Phoenix, including Tempe, New River, Paradise Valley and Fountain Hills. If you don’t understand why or how to use different chemicals or treatments in your pool, or if you have a problem with the quality of your pool’s water, we can come out and help you figure out the problem. 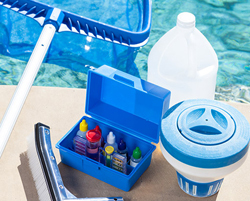 We can offer you our services to keep your pool clear and healthy. We have all the tools and knowledge to keep things clean. If you don’t have the time to maintain your pool, our service is a great way to keep your pool in good shape. 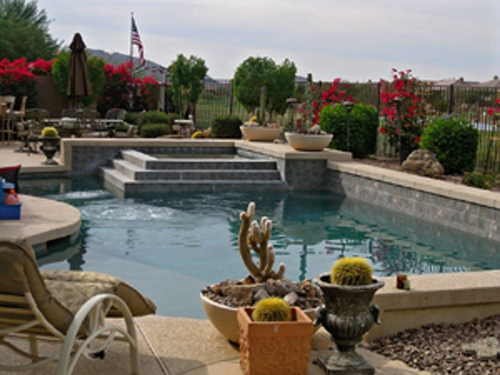 We provide pool maintenance in Phoenix, Arizona as well as New River, Glendale, Scottsdale, Peoria, Tempe, Gilbert, Mesa, Paradise Valley, Fountain Hills, Cave Creek and Carefree and the surrounding areas.